I love it when I make a card for 1 challenge and then it ends up fitting more! Started this for PTW challenge which this week is elegant embossing then I remembered that Saturday's Workout was embossing too and then Wednesday Stamper this week is stripes! It almost fits' another challenge too but isn't quite as the sketch so I'll not force it and leave it at 3! As it was elegant embossing, good excuse for me to use my 'Sweet Kids' set again. The images are quite small so I managed to use a few of them to create a longer scene. Have embossed the images with a holographic black embossing powder (if you click on photo you might be able to see it better) and coloured with distress inks. 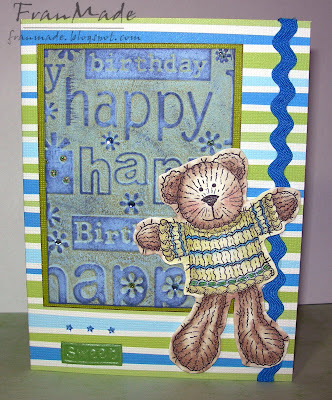 Also dry embossed the card blank with a criss cross pattern using my Scorpal. Wanted to give the square cards a break and do a DL size card for a change. Others: flowers, brads and gems from stash. 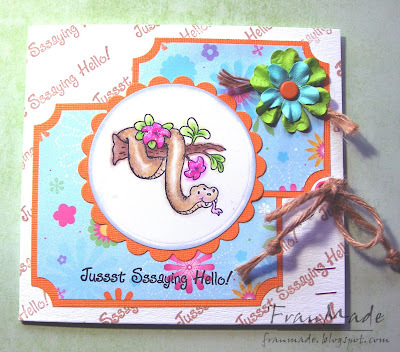 The theme this week over on 'Tilda & Friends ATC', is May celebrations, so maypole, spring flowers, blossoming tress come to mind. Had to lop off Tilda's leg to make her fit which was a bit cruel but had to be done else it wasn't the size of an ATC (2.5"x3.5")! Images: All stamps or part of stamps from the Magnolia sping club kit. The branch is part of the tree swing and the flowers in the grass is part of Tilda laying in the grass . 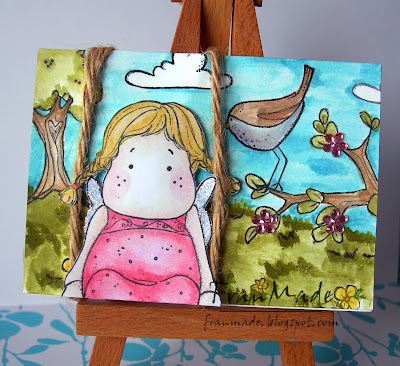 background and bird stamped directly onto ATC and coloured with distress inks. Stuck Tilda onto foam pads and added on top. 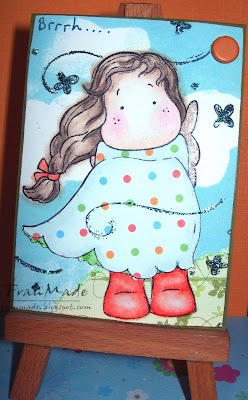 She's coloured with Prismas, pearlescent watercolours and stickles. Others: garden twine for swing and flower gems from stash. Hope it's come across as a lovely blossoming spring day. 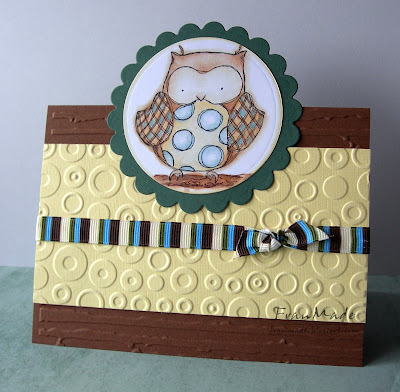 Hop on over here to see all the other fab ATCs the DT have come up with. Think I've just made it for the challenge over on Wednesday Stamper with about 2 hours to spare! 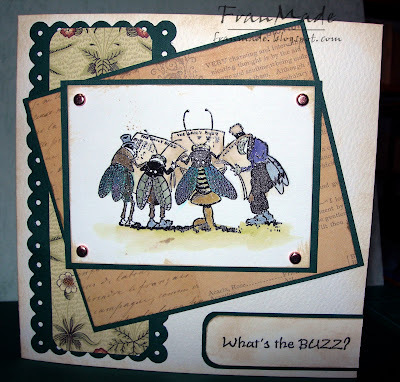 The theme is to use Insects which was perfect excuse for me to use my 'bugs life' set from Crafty Secrets. Their stamps appeal to the vintage/distressed side of me which likes to come out every now and again, so look away if you only like the cute stuff :) . Still never as happy with these as my cute cards, think I need more practice. Images: stamps and sentiment from 'bugs life' Crafty Secrets clear stamp set. stamped & embossed with clear embossing powder and water coloured with stardust pens and distress inks. inked edges of image and card with distress inks. Papers: K & Co and William Morris pad from Joanna Sheen backed onto teal cardstock. DCM this week was to distress your card but I think I've only slightly perturbed mine LOL, as it's just a bit of tearing but it still counts right?! 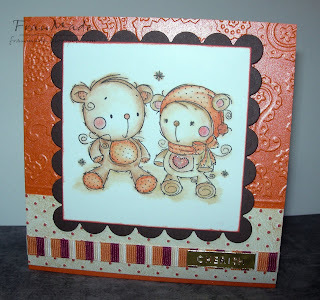 This stamp is another range designed by Rachelle Anne Miller, Lily & Milo available from Glitterpot. They are clear stamps and I have found that some of them have thicker lines than what you may expect from looking at the illustrations and other stamps i.e loses some of it's sketchy appeal and I thought looked like a kid's colouring in picture IYKWIM. No, it's not my stamping, the actual acrylic lines are thicker but not on all of them. 'First Love', 'Angelface' are fine as I have those but I sent some of the others back (brilliant customer service from Glitterpot) so just a heads up in case you're like me and want them to look exactly like the illustration. If you're not that fussed then it won't matter. Others: Sentiment printed off pc and punched out with SU word window punch. Billy cut out and matted with petite scallop oval nestabilities, edges inked and gems from stash. That's it - told you it was quick! This was made the other day to go with some things I sent for someone. Hopefully they will have got this or will not see this until they do! 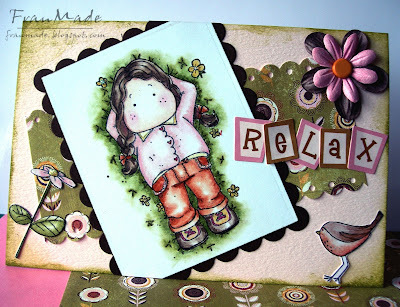 It's reading reverie by Stamping Bella. I love these fairies, this one just looks so serene. Anyway, it was a quicky card to catch the last post. 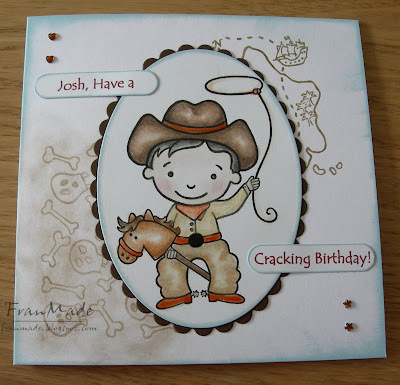 Kickstand card with cuttlebug embossed bottom half and Laura Ashley paper on front top half. Coloured with prismas/sansodor and sticky ribbon, gems from my stash. Off to work in a bit, so have a good evening and relaxing Sunday. Probably not post now till Monday. Have mounted all my Magnolia Spring stamp club stamps now and I have to say, they are well worth the money. Got 5 Tildas, 1 edwin, then 8 different extras including a fab tree swing. Anyway, made this quick card with one of my favourite Tildas on there (the bird and flower are off the kit too), she's laying daydreaming in the grass, love it. Used Nicola's sketch over on My paperworld. Colours are brighter IRL must be the grey weather, hope you like it, off to work now. 1.If a movie was being made of your life, who would you like to be cast to play yourself and why?2. You are spending a whole month on a desert island for charity and you have to choose your favourite celebrity to spend the first two weeks with and your least favourite celebrity to spend the second two weeks with. Who would they be and why? 3. What are your three favourite craft products? 4. If you could invent something to do anything, what do you think it would be? 6. QVC or Create and Craft? 1. Well, if I was limited to choosing chinese actresses that are well known to UK/US audiences I'd be stuffed - Michelle Yeoh(was a bond girl) too action/old, that one in Grey's Anatomy?!! doesn't look like me, Zhang Zhi Yee (crouching tiger actress) - I wish, but too young and skinny! Anymore? I can't think of any, can you?! If you could suspend your disbelieve then I would probably go for Sandra Bullock just because I like her both in terms of looks and personality and she comes across as a very grounded person who doesn't take herself too seriously. 4. Bank account that was self replenishing then could indulge in crafting, spending time with Hubby, family & friends and travel the world. 6. QVC but haven't watched for a while now, too much Dawn Bibby and kits which are just cut and paste. 7. DCWV but dovecraft would be a good cheaper alternative. 8. Don't really have one about from seeing the odd celeb here and there, oh and did have a footballer, Jason McAteer as a customer at our old take away. I know, very lame. Right that was too difficult and I'm probably too late in passing this on so will leave it open to whoever would like to have a go, be my guest! So back to the card, it was for the Ismaki sketch, the optional extra which I've managed to use, is to use 4 different patterned papers. For this I used my Sweet kids crafty secrets set - I love these vintagey story book style drawings, so fell in love with them as soon as I clapped eyes on them. This one is a bit distressed looking (I was on a roll with my distress inks last night) and colours are a bit muted so may not be everyone's cup of tea. Base card is chocolate but looks darker in photo?! Papers: K & Co don't know the range it was a big value 12x12 pack I got off QVC last year (don't think I'll ever finish it as I still haven't got round to doing any scrapbooking). Now what do I play with first . . . .?! It's Thursday again which means it's time for another cute card challenge. After last week's male theme only fair for it to be the girl's turn. So something for the girlies. 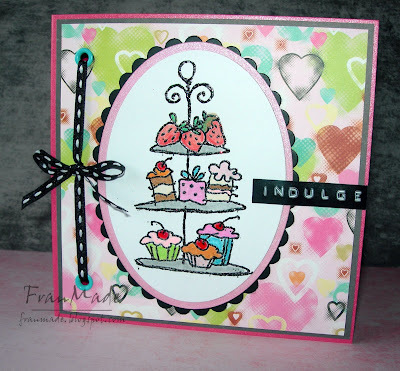 Was going to go for the shopping theme but that was covered by some of the other DTs (hop on over to see the other fabby cards and also the 2 sets of Studio G mini stamp sets up for grabs) so instead I went for the next best thing . . cream cakes :), Enjoy . . .
Off out now, will be back later. This week's PTW is a sketch set by Katharina which is fab but always takes me longer to fit all the bits together! I seem to be needing to use 5.5" square cards more too, even though I have tons of ready made card blanks in all other sizes under the sun I end up having to make my own! Also thought I'd take part in the new challenge site Saturday's Workout which this week is to use distress inks. I've been meaning to practice colouring with my distress inks for a while now so thought this was as good an opportunity as ever. Dug out one of my old stamps for this, a flower fairy. Papers: Laura Ashley Traditional pack plus blue bit from Brenda Pinnick scrap pack(finding some of the L Ashley papers a bit hard to match and use together by themselves). 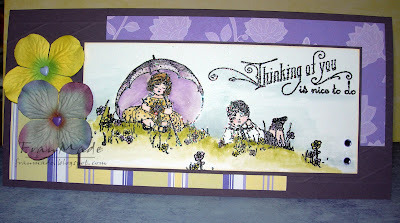 No not me but this week's ATC theme. So anything with dots on your ATC. 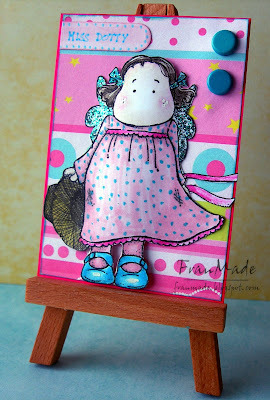 I'm trying to use a different Tilda on my ATCs every week. This week went for a Tilda with a biggish dress that I could turn dotty and I liked the look of this one. Image: 'tilda with straw hat' cut & coloured with a bit of everything this week, made her dress dotty. Added white highlights with a white ink pen, aqua stickles to her wings and hairbows. Curved Tilda and stuck her down with foam pads running down the middle of her only, either side of her is stuck flat onto the ATC. Paper: just a bright scrap piece which had dots on it. Been a very productive day for me cardwise, must be the weather. It's been a glorious sunny day, actually feels like spring is finally here, lets hope it stays (then again, if it does I'm gonna have to mow the lawn soon :( ). Managed to finish my 2 DT cards, another one I can't show yet as the recipient reads my blog and I haven't sent it yet and finally this one. Background: orange pearlescent card blank embossed with paisley cuttlebug folder 2/3rds of the way. bottom third covered with white card which was embossed using swiss dots folder which was inked with antique linen distress ink first then swiped burnt sienna chalk ink over the dots after embossing. Others: ribbon and gold 'cherish' peel off from stash. Hello again, I'm back. Didn't manage to get the new Dovecrafts paper not that I needed them but my Papermill shop didn't have them in yet. Usually they have them really early and when I'm not expecting them but the one time I am ?. . typical! Anyway, went to the art/craft shop instead (the only other crafty place in Liverpool centre that I know of) and got some stuff there instead. They had loads of lovely ribbons and gems look! Also, as I was at the till saw they had some copic markers reduced to £2 each (normal price £4.95!) so I got them just to see what they were like for myself as I've seen some wonderful cards using them and wanted to see what the difference was IRL compared to pencils and normal waterbased markers (these are alcohol based). I used them to make this quick card using my new bella stamp (It's not great as obviously only had the 3 colours to play with). Just added some stickles for extra sparkle. They do colour beautifully for ink pens and obviously a lot quicker as no phaffing with stumps and sansodor plus the pens themselves are very pretty (as far as pens can be!). However, I will resist for now as they are pricey and you would need quite a few shades of each colour to get the shading I'm used to with my Prismas. even if I got them from US as I'd want at least the 72 set to start it's a lot of money. Putting my sensible head on it's more a 'nice to have' then 'must have' and I'm doing o.k with my Prismas. One for my present list I think! Hope you all had a lovely Sunday, I made this last night for this week's tilda & Co challenge but it was a bit late (and technically Mon) so I'd thought I'd leave till the morning to post. Images: All Magnolia stamps (except the grass which is a mini Studio G set) stamped Tilda and the bird first, then the flowers before I decided I wanted a bit more depth so then just masked them and stamped the grass and tree round them. All coloured with Prismas/Sansodor then glossy accents on her boots and the round balloon. Stickles glue on the flowers, bird and the other balloon. Paper: from BG 'Boxer' pad. Others: Ribbon from the fab blog candy I won a while back off Marlene. Party typed with Dymo then punched with SU word window punch. Just real quick card today using Bella stamp that flew over with some fairy ones and landed today, wheyhey! Will add sentiment later, but must dash off to work now. Have a good night! Ismaki sketch this week was a tough one as the obvious thing to go for was a window scene but I desperately wanted to use my new Crafty Secrets stamps which didn't really suit this sketch. However I was determined to use them so ended up with something I'm not that happy with it but I do love the images. 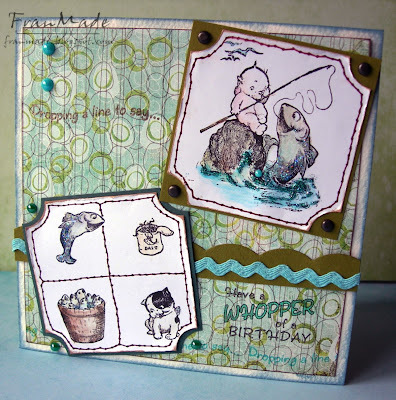 Images & Sentiments: 'Fishing Buds' Clear stamp set by Crafty Secrets (American co. I got mine off Ebay) coloured with a bit of everything plus stickles on top of the fish! Distressed edges and added faux stitching as I wanted a more vintagey feel to go with the look of the stamps. Paper: patterned piece from BG Pheobe paper pad. 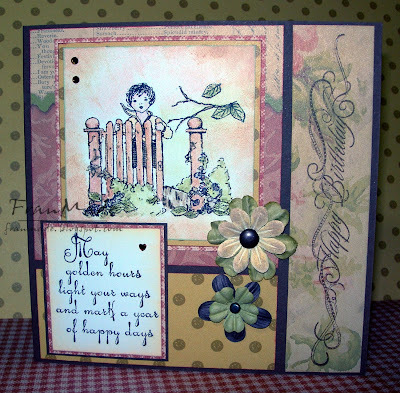 Added cardstock border cut with quickcutz border die. Thanks for stopping by, hope you all have a lovely weekend.
' 3 birds with 1 stone' . . .
. . or to be precise, 3 challenges with 1 butterfly card. I planned to combine 2 challenges, the third was a fluke! Image: Butterfly is a Stampendous stamp. Sentiment stamp I've had a while now and can't remember make as it's unmounted. Butterfly coloured with prismas/sansodor then went made with my stickles glue - click on photo to see glitter better. flower gem in the centre. Butterfly wings are slightly raised with foam pads. 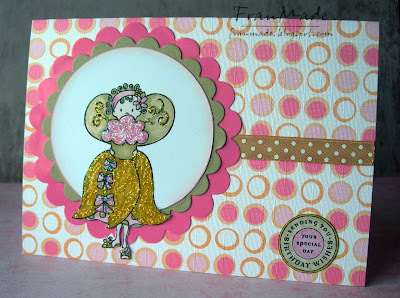 Papers: finally used some of my Laura Ashley papers I've had for a few weeks now! Circle cut with nesties then cut around part of the flower on the paper and placed circle behind it as I didn't want to lose the flower. Yellow scallop pieces cut with a die I just had to get when I saw it as I've got this thing for scallop edges at the moment. It's actually a 2 part die by docrafts for their die cutting machine and has another die with small handbags and flowers but I got it just for this bit! Works in my cuttlebug with c & b plates. Others: ribbon from stash and just went over some of the flowers with my clear sakura stardust pen for more sparkle. Theme this week over on CCT, is as the title says, something for the guys (or boys). Always found them hard to do until recently. High Hopes in particular, with all their animal and jungle stamps, I find are great for the guys. 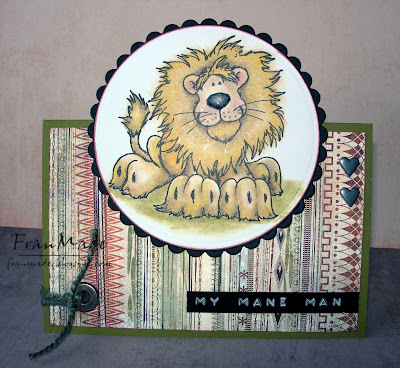 Used Leo (who I've had for a while and is one of their older stamps) and kept it simple as men don't do fussy do they! Image: 'Leo' HH stamp coloured with lots of prismas/sansodor. I couldn't tell you which ones as I used a bunch of them and coloured him to within inch of his life as I couldn't get the right colour I was after! Still think he's a bit dirty looking but nevermind! glossy accent on his nose and white pen over his cheeks and around mane. 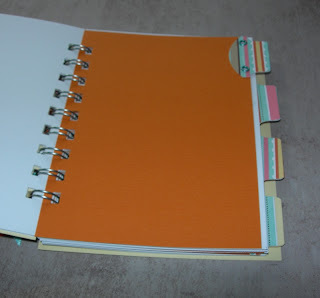 Paper: Basic Grey 'Archiac' pad. love this pad. Others: sentiment typed with Dymo then added some metal snaps and giant eyelet as it's for hubby and he likes metal embellies, didn't think gems would look right on a guy card. There's a fab stamp up for grabs this week, so make sure you enter (see CCT for details). 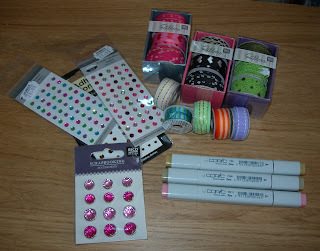 Challenge this week over on tilda & co is to use lots and lots of ribbon. So decided to do something I've always liked the look of but not got round to doing and that's putting lots of ribbon down side of a notebook. So out came my 'bind-it-all' and voila . . 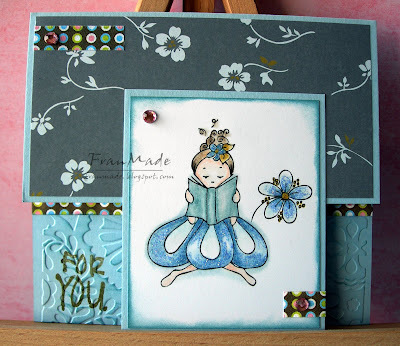 Images: 'love tilda' and envelope both Magnolia stamps. Coloured with prismas/sansodor. heart seal has glossy accent and glitter ontop. Used Dymo to print 'notes'. Ribbons, Prima flowers, metal washer and brads from stash. All a bit OTT but I love it! 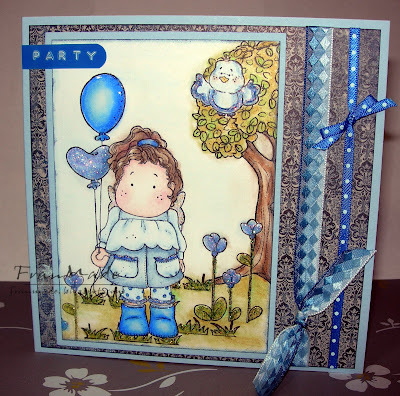 This week's theme over on Tilda & Friends ATC is 'wet & windy'. I don't have the rainy tilda or Mermaid (yet!) so opted for the windy aspect of the theme and used one of the newer windy Tildas. This was a really quick ATC for me as Tilda was stamped straight onto the card and the sky/clouds inked around here with a bit of masking. Green hill she's standing on is a bit of scrap DP stuck around here feet. Her dress is paper pierced. Added stickles to the whispy bits of wind and her wings, glossy accents to her boots so they are super shiny IRL. Then just an orangy brad in the corner which could be the sun in the distance! Oh and hand written 'Brrr...' in the corner with stardust pen. The whole piece trimmed round the edges and matted onto green card, just to frame it all. Hope you'll join in and this week, there's stamp candy - yep, you could be entered into draw to win Magnolia fish if you take part. Good Luck! 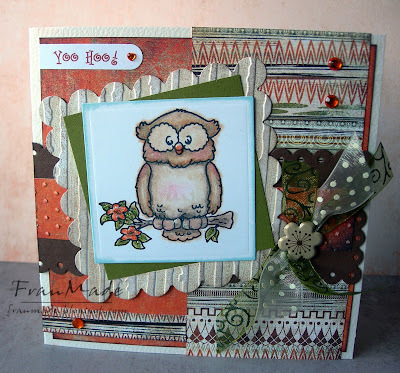 When I ordered my latest lot of High Hope stamps I had tough time trimming the list down but there was one I had to have and it was this owl, simply because it was called 'Frances Owl'! My very own owl, how could I not get her?! So I inked her up today and used up the left over bits of paper from my DT card for CTT (that one will have to wait till Thursday). 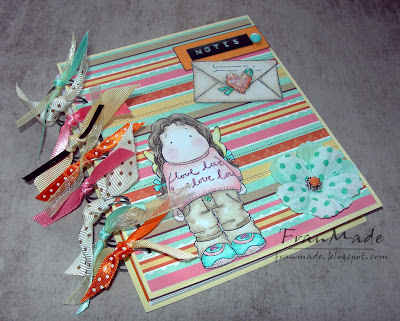 I used my new BG 'archiac' pad which landed on my doorstep today (along with my new lola stamps plus some fab clear stamps from US I can't wait to use :D). I love all the rustic earthy colours and thought they were perfect for my HH jungle images. I have to say I really love this card. You know what I mean, some cards aren't that great to you even though other people tell you they are and then once in a while you'll make one that will make you go 'Ooo'! Think it must be the colours and layers which I love, hope you do too! Papers: from BG Archiac pad. Also lots of cuttlebug embossing and die cutting going on, too many to list but you should be able to see. Really liked how my scallop frame turned out. It was a nesties diecut which I then embossed using the ink brayering method. Wanted to give it a distressed wood grain feel. Others: Sentiment printed off pc and SU word window punch. Flower brad, ribbons and gems from stash. Just hopped on over to Arty Girlz challenge and have realised this card fits the bill for this weeks' challenge, which is ribbons. Fluke or what?! Just a quick card today as I've been out today, glorious sunny day that it was. I wanted to try and do the Sweet sugar challenge that was set 2 weeks ago but am a bit late as the new one is up now! Anyway, the old challenge was to make a 2 cards for boys/men. Seeing as the new challenge is up now I've just made the one, with my neglected LCR stamp, and quickly put this together. 2 weeks obviously isn't long enough for me LOL. Won't bother with a materials list as it's just patterned card base with cuttlebug embossing folder ontop plus all the bits that you can see. Also been naughty and bought more stamps, it really is an addiction with no cure. Just glad most of them come unmounted these days as my craft room is getting fuller by the minute (hubby says our house tilts under the strain!) Just have to be very patient now as they aren't shipping till June,. . . . uhhh, the suspense is killing me. Just a quick folder card today, that I made with some left over papers and one of my new High Hopes jungle stamps, 'Ssstanley snake'. Sentiment is HH too (freebie with my order) stamped all over background and under main image. Just matted and layered everything and added some flowers and tied together with some garden twine from B&Q. Photo's not very good as it's not that bright an orange IRL but not much daylight left so can't get it any better. Been a lazy relaxing day today, as Sundays should be! Hope yours was too. High Hopes & more crochet playing!